Learning the Flowers: There are endless reasons we all fall for the mountains, but one enchants us above all others: This place feels like home in our hearts. 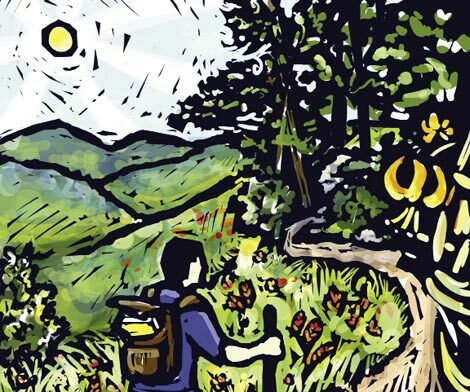 Here, five writers share how their deep connections to these hills were forged with Sunday drives, old-time music, wildflower hikes, and through the discovery of inspiration and strength. On unscheduled afternoons during my sophomore year of college, I would pack a few things into a suede-bottomed daypack, climb into my Volkswagen bus, and drive to nearby trailheads. I was newly released from military duty and had spent most of the previous year growing my hair and refusing to shower. I needed a break from myself. I found it in the woods. The Black and Craggy mountains were my usual destinations, and I came at them from a variety of points. I often brought lunch: a roll of crackers, an apple from the school cafeteria, and a sweating piece of cheese, which I’d garnish now and then with a bit of Indian cucumber root or wild mint found along the trail. From time to time, I paused to sit on flat rocks and admire the views. Occasionally, I was moved to write poetry, most of it bad. I brought a compass with me in case I got lost, though I confess I never learned to use it. It was the wildflowers, above all, that held my interest. I came to know the spring ephemerals, the toothwort and trout lily, bloodroot and mayapple, whose parasol leaves huddle in April like the Kentucky Derby’s infield crowd. Early summer had its own charms—the fire pink and Indian paintbrush along the rocky, south-facing slopes; bluebead in the seeps and low places; and later, in the damp clearings, the Turk’s Cap Lily, seven feet or more of whorled leaves and speckled blooms. Higher up the mountains, purple-flowering raspberry, carrion flower, and poke milkweed put on their own modest show against a backdrop of passing clouds. My parents had given me a copy of Newcomb’s Wildflower Guide for my birthday, and I began studying its pen and ink drawings as a sacred text, lessons that expanded considerably when a hardbound copy of the Manual of the Vascular Flora of the Carolinas fell into my possession. The book’s details of form and nomenclature were lost on me; it took more patience than I could summon to make sense of descriptions like, “leaves thricely compound, adnate, lightly pubescent beneath, pith chambered.” Even without a store of big words though, there was plenty to learn through simple observation, like the fact that the homely, 400-grit leaves of the trailing arbutus hide tiny blossoms with a fragrance as sweet and delicate as any you’ll find. And those “common” names: clammy cuphea, rattlesnake master, putty root, viper’s bugloss, hoary mountain mint—how could you not love them? Author Edward Abbey once called the Appalachian Mountains the “vegetation cradle of North America,” and so they are. These mountains nurture one of the temperate world’s most diverse collections of plant life, and our own blessed corner is the garden spot of all. True, by the time I reached them, the mountains had already suffered through two centuries of rough handling: slope farming of tobacco and corn, unrestrained logging, the muscling in of exotic species. Not that any of it lessened my appreciation for the place or my sense of discovery. I remember one afternoon coming down a gravel switchback on Mount Sterling, the VW balking and farting, when I glimpsed my first yellow lady’s slipper, a native orchid so ideal that I would swear it was lit from within. People see these all the time, but to me, at that moment, nothing in the world could have been more beautiful or rare. Now and evermore, it might be the best wisdom of all. A 1995 graduate of Warren Wilson College, Kent Priestley is a longtime contributor to WNC magazine. He lives in Wilmington, Delaware, and can be reached at www.kentpriestley.com.